I love whiteboards. When I've had my fill of sitting at my desk or in meetings, nothing helps me focus more than standing up at my desk and whiteboarding something: a to-do-list, process flows, wireframes, use case diagrams, an document outline, pretty much whatever I am working on. Sometimes, I will just write out my work before typing it out. There's something about standing, the process of writing slowly on the board... it's almost meditative. When I have very heavy weeks, it's common to find me whiteboarding on Friday; it's a great way to clear my head and get productive when I would otherwise feel tired or overwhelmed if I just sat at my desk. Which is why I love Wipebook. 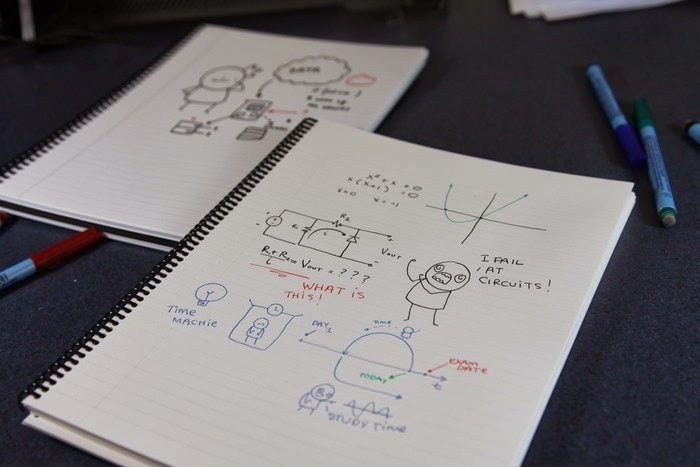 It's basically a notebook in which all of the pages are little whiteboards! Now, you might be thinking that it looks like an ordinary notebook but the pages are laminated so that you can write on/ wipe off everything you put in the book. Super handy. I was lucky enough to receive a Wipebook as a gift from my friends, @mhellstern and @kentdaitken. And I can attest to its sheer awesomeness; I worked on a presentation this weekend using the wipebook to document and sort all of my ideas. Love love love it. It has been a crazy start here at Wipebook, most notable is the unexpected demand growth encountered during our Kickstarter campaign that was funded at 100 times the original goal. The intent of the latter-mentioned campaign was to essentially raise additional funds to augment development efforts surrounding the ensuing version of the Wipebook, the Wipebook 2.0. And from the campaign's inception, backers cordially received the product, such that within 24 hrs we had exceeded a pre-defined revenue goal of $4,000. Within 3 days, we had surpassed that value by 800%, with over $30,000 in generated revenue. At this point we were projecting $200,000 in total at the campaign's termination date of December 23, 2013; however, this approximation had literally doubled -- we eventually exceeded $420,000 in backer revenue. Needless to say, we think that we have identified a nascent need for a whiteboard-notebook. How amazing is that? If you want one of these gems, you can pick one up on the Wipebook website for $30. They come in blank, lined, grid, mixed variants and music. If you're as much of a whiteboard aficionado, this is a must in your office arsenal.